The Da Vinci Gilder’s Tip is an essential tool for oil gilding using gold, metallic, and silver leaf. Prior to lifting the gold leaf off the gilder’s cushion with the tip, gilders will move the brush over their hair or the palm of the hand. 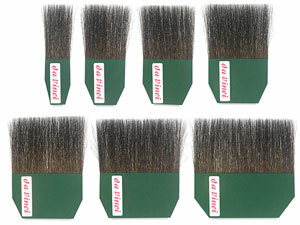 This oils the brush lightly and creates static, which ensures a good hold of the metal leaf to the brush. Series 502 — Double Gilder’s Tip contains pure blue squirrel hair of a double thickness in a red holder.